Real life demands flexibility. With the Flip hybrid nappy system, you can choose from three absorbent inserts to meet your changing needs - 2 resuable and 1 disposable. With Flip you are free to change it up and enjoy life wherever you go! The Flip Cover is compatible with 3 insert types: stay-dry, organic or disposable. Stay-dry for the sensitive baby. Smooth, stay-dry fabric wicks moisture from babys delicate skin. 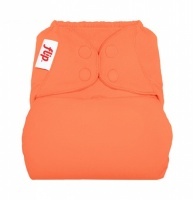 3 layers of microfiber cloth absorb quickly and keep baby drier, longer. Organic for the natural baby. Available in day-time and night-time absorbency. - Revolutionary Oeko-Tex 100 approved bamboo Disposable Inserts. Flip Disposables are the first ever disposable insert to be fully Oeko-Tex approved. As a one-size they are easy to use, dye free and fragrance free! The innovative Flip Disposable Inserts give you the option of a disposable reusable system which meets the demands of your lifestyle. 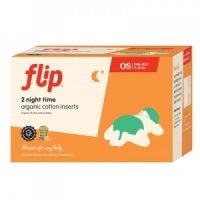 Because Flip Disposable Inserts are trimmer than your reusable cloth inserts, you may need to use a smaller snap setting on your Flip Nappy Cover to keep the insert in place. Simply pick the insert you need and fit it neatly under the two contour flaps inside the cover which hold it securely in place. When you're ready to change simply toss the used insert, choose a fresh one and reuse the cover upto five times before washing - great news for the environment and time-strapped parents. 2.Toss the used insert into your nappy bucket (if using stay dry or organic) or general bin (for disposable).